In yet another step towards self-driving vehicles, Google Unveils Steering Wheel-Less Car Prototype. We’re now exploring what fully self-driving vehicles would look like by building some prototypes; they’ll be designed to operate safely and autonomously without requiring human intervention. They won’t have a steering wheel, accelerator pedal, or brake pedal… because they don’t need them. Our software and sensors do all the work. On Tuesday night, onstage at the Code Conference in California, Brin revealed an entirely new take on a self-driving car, one decidedly more ambitious than anything we've seen before. Nothing about this car is traditional: it has a front made of compressible foam, a flexible plastic windshield, and a dual-motor system that keeps the car running even if part of its engine fails. It's easy to imagine executives at GM balking at quite literally reinventing the wheel to help Google X with its latest moonshot. Self-driving cars are coming. That's essentially a given: the technology already mostly works, and nearly all automakers believe autonomous vehicles are both a good and feasible idea. They disagree only on the timing, though "by 2020" has become an increasingly popular refrain. The biggest remaining challenges appear to be regulatory rather than technological, as governments start to answer questions like who's responsible when a self-driving car gets in an accident. In classic Google fashion, though, Brin talked less about what the Google car could mean for Google and more about how it might change the world. What if we all sold our cars? What if every time we needed a car, we unlocked our smartphones and called for one with a single tap, and as soon as it dropped us off it went off to its next job? We'd need fewer parking lots, reduce our emissions, stop driving drunk, and get in fewer accidents. Those who couldn’t or shouldn’t drive – the blind, the elderly — could still get around. This is the future Brin imagines, one with huge ramifications on everything from the environment to the economy. And the cute little car he's been developing at Google X is the closest thing we've ever seen to making that idea real. Eventually it's going to work, though, even if by the time autonomous vehicles hit the mainstream they'll more likely have a Ford or Nissan logo than a Google Doodle. Google doesn't have the scale, the infrastructure, or likely the desire to enter the car market in a real way. Google's car will force lawmakers to finally figure out what happens when cars stop helping us drive and starts truly driving us. It will force automakers to think two steps further down the self-driven road than they had before. It will force customers to get used to the idea of not owning a car, and the notion that it's actually more convenient doing things the Uber and Zipcar way. It’ll teach us to think of cars as public transportation, a service provided for us. Even if we're years away from the wide availability of the technology it's now clearer than ever that's what a "self-driving car" really means. Last year Toyota made a big splash with wheel-less vehicles, however,Toyota is totally on the wrong track. The steering wheel-less Toyota prototype detects the driver's movements, leaning this way or that to control turns. Applications of that nature are fine for artificial limbs, but that is precisely what one would not want from a drunk or tired driver. 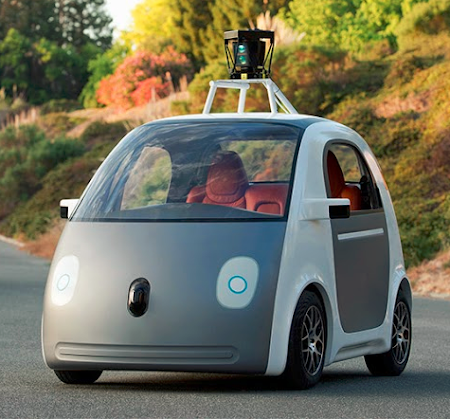 Google is not interested in manufacturing cars. It is interested in software licenses and patents on tens-of-millions of driver-less vehicles worldwide. The wave of the future is self-driving taxis, which is really what a steering wheel-less car is. The concept will end the debate over taxi licenses, and taxi vs. limo pickup restrictions and other such nonsense, once and for all. But driver-less cars will not happen overnight. Perhaps not even by 2020. Yet, within a decade, there will be monstrous changes in the ways we currently think about transportation. Driver-less cars can now get licenses (see Driverless Cars Legally Hit Roads as California Issues Licenses; The Last Mile). So why not licenses for drones? That is coming too. For discussion of an Amazon pizza delivery drone prototype, please see How Will Pizzas Be Delivered? Do You Tip a Drone? Eventually it will not take a car of any kind to deliver your pizza, but rather a mini-drone that will deliver your pizza faster, fresher, and hotter than any road vehicle can. Looking ahead, if drones can deliver pizza, why not stuff much larger? Well, that will take more time, but not that much more time. Once drones are licensed, the sky is the limit. Millions of people have jobs that will vanish and skills that are totally useless. Technology makes things better and improves standards of living. As such, technological improvements are hugely price-deflationary. And contrary to what many think, there is no downside. Would we be better off with horses than cars? Better off with no cell phones or artificial limbs? The downside is not vanishing jobs, per se. Rather, the downside is a Fed hell-bent on creating inflation in an inherently deflationary world.